Four in line for the throne - MIniature Sheet for the Queen's 90th Birthday. Tomorrow is the 90th Birthday of Her Majesty the Queen, and although most of the special stamp designs have been revealed, tomorrow was the day when designs for all the stamp products linked to the miniature sheet were to be released. This year is the 500th anniversary of the postal service, and today Her Majesty is today visiting the Windsor Royal Mail Delivery Office. As the Syndey Morning Herald puts it, subtly, she is pointing out that her lifetime is a modest fraction of the history of this civilised realm. Some of the Royal Mail Choir are going to serenade her – a choir from the BBC reality series Sing While You Work. The press have duly been briefed and the design of the miniature sheet of 4 x 1st class stamps has been released earlier than expected. 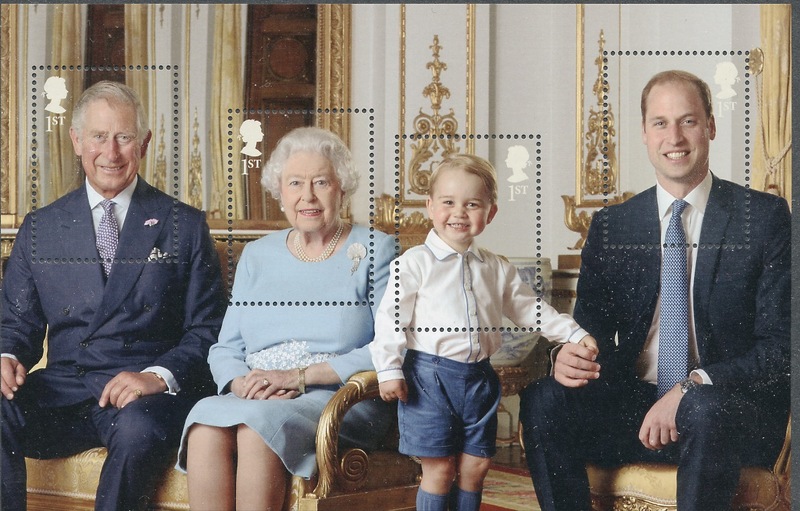 The photograph used for the sheet shows Her Majesty The Queen, His Royal Highness Prince Charles The Prince of Wales, His Royal Highness Prince William of Wales The Duke of Cambridge, and His Royal Highness Prince George of Cambridge. This represents the line of succession to the throne of the United Kingdom. The sheet is again a massive 179 x 74 mm, almost impossible to use even on a c5 envelope. The stamps are 27 x 37 mm, and the sheet is printed in litho by International Security Printers. 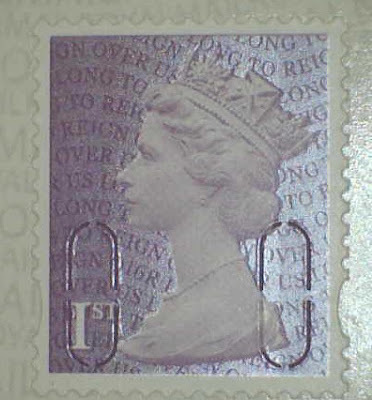 As previously mentioned, the MS is also included, in a slightly different form, in the prestige stamp book. The individual new Machin definitive stamps are the 1st amethyst purple (O16R REIGC) from the above retail booklet, and the 1st red (M16L MPIL) and 1st amethyst purple (O16R REIGP) from the prestige stamp book. These have been added to our checklist which will be published after our break. 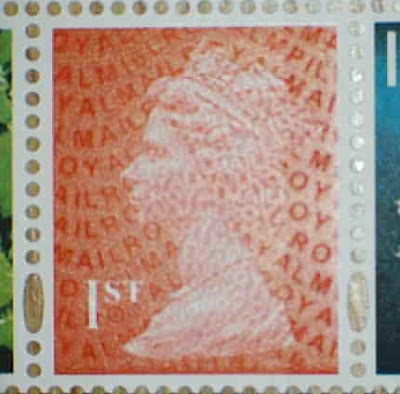 The last blogpost listing the Machin definitive stamps has been updated with these. Unusual (unique?) to have a stamp featuring both a photo of Her Maj plus the Gillick cameo. I assume they thought it would look a bit unbalanced to leave the cameo out on just one of the four. Is there any reason why the Royal Mail has put the cameo of the Queen on the stamp that depicts her as I thought this was unnecessary. Wasn't it already the case in the miniature sheet commemorating the Queen Mother's 100th birthday? Yes, I agree most unusual. Stamps with images of HM do not usually have any other identifying cameo/silhouette. They are still available to buy on Royal Mail's web site. I ordered two of them a few days ago. 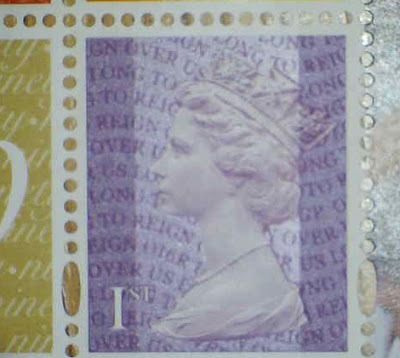 I too thought this was a first to have the cameo head on a stamp that has the Queen as the main subject of the stamps. Upon checking back I found that the miniature sheet of the Royal family issued in August 2000 for the Queen Mother's Birthday also has a cameo head on the stamp with the Queen on it. 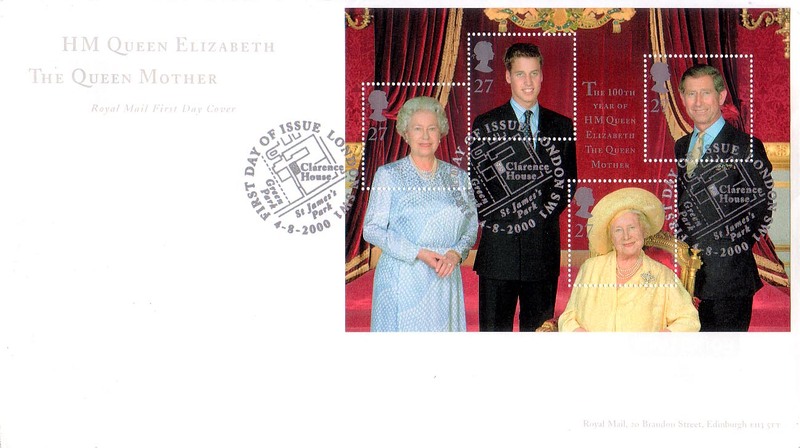 However, the miniature sheet of Photographs of the Royal Family issued on the 16th October 2007 did not have the cameo head on any of the four stamps with the Queen on them. 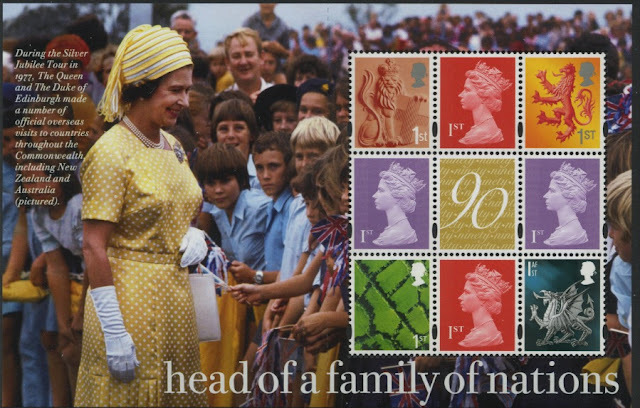 So it would appear that when the miniature sheet is made up from a photograph of more than one member of the Royal Family any stamps featuring the Reigning Monarch on it has the cameo head as well, while others do not. Anonymous and Brian are quite right - the Queen Mum's miniature sheet can be seen here, and the Diamond Wedding photos here. So I'm right that it's unusual! Brian and others are correct to say that it is normal, when there is a mix of designs on a sheet, then the profile/cameo head will be used. Yes, it IS different, it IS unusual, but it is NOT WRONG, and it's not a break with tradition ! Just couldn't resist it any longer! - I think the title of this blog should start 'Three in line for the throne..' Hope you are well, we haven't seen any new blog lines lately. Regards. Ooh! Yes, you are correct - not such a clever headline after all. Is it just me, or has anyone else not yet received their Standing Order for the QEII 90th Birthday issue? I've called Tallents House several times now, and although they are always polite, understanding and apologetic, I feel this is very poor service. This issue will have been planned months, if not years, in advance and could easily have been predicted to have been popular, and yet RM just don't seem to have geared up for it. Once it arrives (if ever) I will certainly have a moan in writing - just no way to treat a Standing Order customer (for all issues) of over 35 years! My ANZAC Customised Sheet has also not arrived, presumably caught up in the QEII issue debacle. Shocking planning and service. End of rant. I understand many SO regulars in the same position. OTOH I ordered Q90 PSBs last week and got them in 3 days. I sense another blog post coming on. I know I live in one of the world's most isolated cities, but I just received yesterday, 14 July, my standing order QEII 90th Birthday 'new issues' of 21 April. I'd just about given up hope and was contemplating sourcing them from an Aussie dealer, despite the ridiculous mark-ups. RR Perth, Western Australia.